Political asylum is the granting of refuge to an alien in a foreign, sovereign state or its territory. Asylum may be temporary or permanent. An asylums is an area considered safe and has traditionally taken the form of a church or other religious institution. In contemporary international law, asylum is the protection granted to a foreign citizen by a state against that individual's home state. This is not an automatic right of an individual, nor is any state required to give it. In fact, most nations have extradition treaties with other nations, and so an individual wanted for a crime will not normally receive asylum. Asylum is generally designed to protect individuals accused of political offenses or suffering persecution at the hands of their government, and as such would not be a threat to any nation that took them in. Although political asylum is a positive situation for one whose life would otherwise be in danger, to live as an exile from one's homeland is not ideal. Thus, while the United Nations and other bodies have set standards to determine the validity of a request for asylum, they also work to protect the human rights of all people within their own nations. When all people are able to live in safety and freedom, in their homeland, there will be no more need for asylum. Right of asylum (or political asylum) is an ancient judicial notion, under which a person persecuted for political opinions or religious beliefs in his or her country may be protected by another sovereign authority, a foreign country, or church sanctuaries. Many ancient peoples, including the Egyptians, the Greeks, and the Hebrews, recognized a religious "right of asylum," protecting criminals (or those accused of crime) from legal action to some extent. This principle was later adopted by the established Christian church, and various rules developed to qualify for protection and just how much protection it was. According to the Council of Orleans in 511, in the presence of Clovis I, asylum was granted to anyone who took refuge in a church, in its dependences, or in the house of a bishop. This protection was given to murderers, thieves, or people accused of adultery. It also concerned the fugitive slave, who would however be handed back to his owner if he swore on the Bible not to be cruel. This Christian right of asylum was confirmed by all following councils. In England, King Ethelbert made the first laws regulating sanctuary in about 600 C.E. By the Norman era after 1066, there had evolved two kinds of sanctuary: All churches had the lower-level kind (sanctuary within the church proper), but only churches licensed by the king had a broader version (sanctuary in a zone surrounding the church). There were at least twenty-two churches with charters for a broader kind of sanctuary, including Battle Abbey, Beverley, Colchester, Durham, Hexham, Norwich, Ripon, Wells, Winchester Cathedral, Westminster Abbey, and York Minster. Sometimes the criminal had to get to the church itself to be protected, and might have to ring a certain bell there, or hold a certain ring or door-knocker, or sit on a certain chair ("frith-stool"), and some of these items survive at various churches. 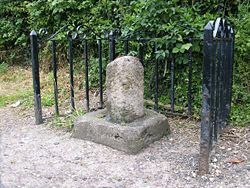 In other places, there was an area around the church or abbey, sometimes extending as much as a mile and a half, and there would be stone "sanctuary crosses" marking the boundary of the area; some of those still exist as well. Thus, it could become a race between the felon and medieval law officers to the nearest sanctuary boundary, and could make the serving of justice a difficult proposition. Church sanctuaries were regulated by common law. An asylum seeker was to confess his sins, surrender his weapons, and be placed under the supervision of the head of the church or abbey where he had fled. He then had forty days to make one of two choices: Surrender to secular authorities and stand trial for the crimes against him, or confess his guilt and be sent into exile (abjure the realm), by the shortest route and never return without the king's permission. Anyone who did come back could be executed by the law and/or excommunicated by the Church. If the suspect chose to confess his guilt and abjure, he would do so in a public ceremony, usually at the gate of the church grounds. He would surrender his worldly goods to the church, and his landed property to the crown. The coroner, a medieval official, would then choose a port city from which the fugitive should leave England (though the fugitive himself sometimes had this privilege). The fugitive would set out barefooted and bareheaded, carrying a wooden cross-staff as a symbol of his protection under the church. Theoretically he would stay to the main highway, reach the port and take the first ship out of England. In practice, however, the fugitive could get a safe distance away, abandon the cross-staff and take off and start a new life. However, one can safely assume the friends and relatives of the victim knew of this ploy and would do everything in their power to make sure this did not happen; or indeed that the fugitive never reached his intended port of call, becoming a victim of vigilante justice under the pretense of a fugitive who wandered too far off the main highway while trying to "escape." Knowing the grim options, some fugitives rejected both choices and opted for an escape from the asylum before the forty days were up. Others simply made no choice and did nothing. Since it was illegal for the victim's friends to break into an asylum, they remained safe there. However, the church could deprive the fugitive of food and water until a decision was made. Henry VIII changed the rules of asylum, reducing to a short list the types of crimes which were allowed to claim asylum. The medieval system of asylum was finally abolished entirely by James 1, in 1623. The United Nations 1951 Convention Relating to the Status of Refugees and the 1967 Protocol Relating to the Status of Refugees guides national legislation concerning political asylum. For members of the European Union, right of asylum is also defined by article 18 of the Charter of Fundamental Rights of the European Union. Under these agreements, a refugee is a person who is outside his or her country of nationality's environment (or place of habitual residence, if stateless) who, owing to a fear of persecution against his or her account of a protected grounds based by the persecuting state fundamental terms and conditions as a member of that state and is unable or unwilling to avail or grant himself or herself to or of the protection of his or her state. The criteria of the protected grounds of one's own state's accounts include race, nationality, religion, political opinions, and membership and/or participation in any particular social group or social activities. Since the 1990s, sexual persecution has come to be accepted in some countries as a legitimate category for asylum claims, when the claimant can prove that the state is unable or unwilling to provide protection. Sexual persecution takes the form of verbal or physical harassment levied upon a person because of their sexual orientation. On a purely judicial level, only four conditions may be opposed to the accordance of political asylum to someone who has proven being subject to persecution in his or her country: The presence of the alien represents a serious threat to public order; the request should be addressed by another sovereign state; the request has already been accepted in another state; or the request is an abuse on the system of political asylum. Asylum is generally not seen as an inalienable right of all individuals. In reality, the necessity of asylum is determined by the potential host of a refugee. One contributing factor to this situation is the presence of extradition treaties between many nations. These treaties state that a person wanted for a crime in one country and found in another must be returned to the first. For this reason, criminals cannot travel around the world seeking asylum in any foreign land. Asylum is today generally offered to people who are cultural outcasts or suffer the threat of government-sponsored persecution in their homelands. Political asylum is recognized in France (droit d'asile) by the 1958 Constitution. It has been restricted due to immigration policies with the December 30, 1993, law, the Debré law of April 24, 1997, the May 11, 1998, law, and the December 10, 2003, law. Henceforth, critics, including the Human Rights League (Ligue des droits de l'homme—LDH) have opposed what they see as a practical abandonment of a longstanding European judicial tradition. In the nineteenth century, the United Kingdom accorded political asylum to various persecuted people, among whom were many members of the socialist movement (including Karl Marx). With the 1894 attempted bombing of the Greenwich Royal Observatory and the 1911 Siege of Sidney Street, in the context of the propaganda of the deed anarchist actions, political asylum legislation was restricted. The United States honors the right of asylum of individuals as specified by international and federal law. A specified number of legally defined refugees, who apply for refugee status overseas and then asylum after arriving in the U.S., are admitted annually. Refugees compose about one-tenth of the total annual immigration to the United States, though some large refugee populations are very prominent. Since World War II, more refugees have found homes in the U.S. than any other nation and more than two million refugees have arrived in the U.S. since 1980. Of the top ten countries accepting resettled refugees in 2006, the United States accepted more than twice as many as the next nine countries combined. The United States is obliged to recognize valid claims for asylum under the 1951 Convention Relating to the Status of Refugees and its 1967 Protocol. As defined by these agreements, a refugee is a person who is outside his or her country of nationality (or place of habitual residence, if stateless) who, owing to a fear of persecution on account of a protected ground, is unable or unwilling to avail himself of the protection of the state. Protected grounds include race, nationality, religion, political opinion and membership of a particular social group. The signatories to these agreements are further obliged not to return or "refoul" refugees to the place where they would face persecution. This commitment was codified and expanded with the passing of the Refugee Act of 1980, by the United States Congress. Each year, the President of the United States sends a proposal to the Congress for the maximum number of refugees to admitted into the country for the upcoming fiscal year, as specified under section 207(e) (1)-(7) of the Immigration and Nationality Act. This number, known as the "refugee ceiling," is the target of annual lobbying by both refugee advocacy groups seeking to raise it and anti-immigration groups seeking to lower it. The majority of applications for resettlement to the United States are made to U.S. embassies in foreign countries and are reviewed by employees of the State Department. In these cases, refugee status has normally already been reviewed by the United Nations High Commissioner for Refugees and granted by the host country. For these refugees, the U.S. has stated its preferred order of solutions are: (1) repatriation of refugees to their country of origin, (2) integration of the refugees into their country of asylum and, last, (3) resettlement to a third country, such as the U.S., when the first two options are not viable. The minority of applications that are made by individuals who have already entered the U.S. are judged solely on if they have a valid claim for asylum. ↑ United Nations, Convention relating to the Status of Refugees. Retrieved August 28, 2007. Bureau of Population, Refugees, and Migration of the U.S. Department of State. Refugee Act of 1980, text hosted by the Office of Refugee Resettlement, United States Department of Health and Human Services. This page was last modified on 30 March 2019, at 20:24.